Love classic business shirts but looking for something different? Prepare to step into the modern stylish world of Business Casual shirts. Here we dare to try new trends and always dress impeccably with a perfect fit. Experiment by combining neutral colours with exciting contrasts and accents. Wear your custom business casual shirt with suit pants or slip on some chinos. With a business casual shirt, you're free to unleash your creativity and guaranteed to turn heads at the office. 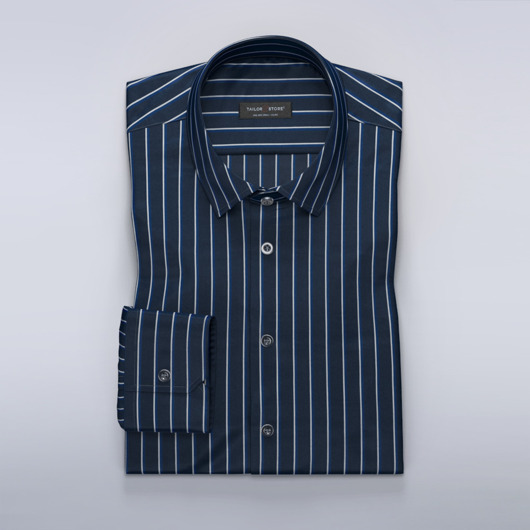 Create a perfect business casual shirt with all your favourite features in our design tool. As always at Tailor Store, the shirt is tailored to your precise measurements. Business casual style are more personal and than classic business shirts. The shirt fabrics are light or medium-thick in twill, satin, dobby or fine oxford fabric. Fine business casual patterns include stripes, windowpane boxes, paisley or florals. Order our one of our recommended shirts or customize to your taste. All shirts are sewn your individual measurements. You don’t have to be boring to be well dressed. Tailor Store shirts are always on trend and designed according to fundamental fabric characteristics. Naturally, we create shirts with the classic business collar, but all our shirts can be customized to your preference. Here we dare more, choosing collars like Cut-away Modern and even Cut-away Extreme for our collection. Flowery contrasts inside collars add playfulness and versatility. Use our design tool and create your unique Business casual style shirt.